Let’s face it, no one likes to be interrupted. But whether it’s on our phones, on websites, or even inside apps, disruptions such as modals and pop-ups have become a painful fact of life. Businesses want us to do something, and it almost never matches what the customer wants to do. At least Wait But Why tries to be apologetically funny about being disruptive. 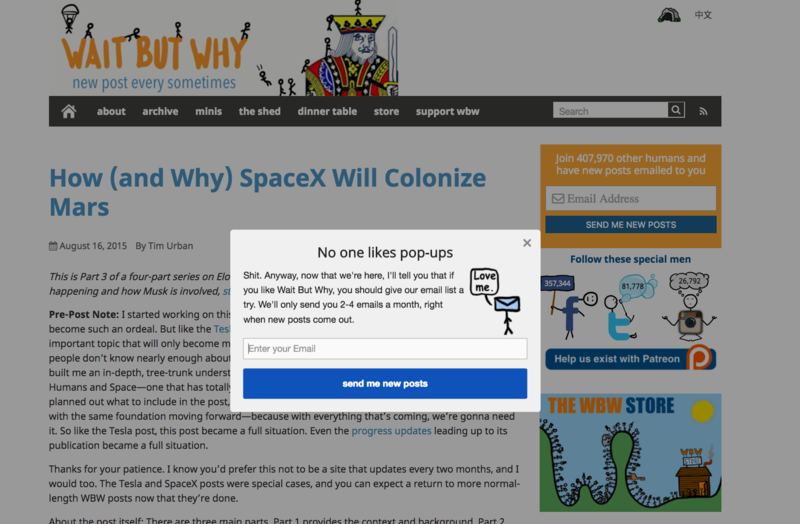 And let’s be honest here – Intercom has contributed to this pop-up epidemic. We’ve heard from many users that they found messages intrusive, so it’s something we consciously set out to fix in our new messenger. Yet disruption has always been far from our intent. Our mission is based in part around helping businesses send relevant messages to targeted customers. But just because a message is relevant doesn’t mean it’s not disruptive. It depends so much on the context of who’s receiving the message – where you are, what you’re doing, and even your current frame of mind. One behavior we’ve seen repeatedly in usability testing is users immediately closing modal pop-up messages, without even scanning them. You probably do it yourself every day. It’s like an automatic Pavlovian response. Time and time again we’ve heard users say: “Oh, I just close those pop-up windows as soon as they come up”. The irony here is that businesses think disruptive pop-up messages will give them the best chance of being seen. But by doing so, they actually make their messages less effective. Even if they’re relevant and timely, disruptive messages are more likely to annoy and overwhelm. Customers don’t engage with the message at all, despite being forced to view it. After hours of watching user tests on web and mobile, that’s the critical ingredient we observed – users want to be in control of their attention, and ultimately their experience. So we wanted to design a messaging system that was flexible in how it could ask for attention. Each message type (a post, note, or chat) can be delivered as a snippet notification. Or if you really want to minimize disruption, you can just use a badge notification. This flexibility means that customers can read your message when they’re ready. They can finish the task they came to your website or app to do. They can even come back tomorrow and read your message if they want. Instead of software bombarding them with messages, they’re in control of the conversation. By being less disruptive you actually get higher engagement. We’ve seen that when you put users in control, they engage much more deeply with the message. Sometimes they’ll still open it straight away, but because they chose to open it, they’re much more receptive to the message. The irony is that by being less disruptive you actually get higher engagement. And just like in the real world, sometimes you have a lot to say, but you don’t need to shout it from the rooftops. You can tell a full, rich story with the post message type, but deliver it as a snippet. It’s like the person at the party who has a funny story to share, but is polite enough to wait for their turn to talk. A final point here on respecting the end user: When you dismiss a snippet, we’ll never show it to you again. On any platform. Your users get to choose how they interact with messages – period. Once dismissed means always dismissed. Sometimes businesses need to be disruptive. But more often than not it’s the unsavory side effect of immature software that simply can’t distinguish between different levels of disruption. For too long we’ve witnessed a one-size-fits-all approach to interruption that completely misses the subtleties of how we’re naturally attuned to communicate. So what can we takeaway? Interrupting users is not always the best way to get their attention. Less disruptive content can actually make users engage more with content. Respectful communication between business and customers doesn’t have to be a myth. When a user feels in control of the conversation, they’re much more receptive to communication. There’s no one-size-fits-all format for messaging. Different types of content have different objectives, so businesses need a range of options to express content. Ultimately we believe our new messenger takes a step forward to making messaging technology more human; by being more personal, less disruptive, and simply more respectful of end users. That’s why we’ve built these good manners into our product – so that our customers can be friendlier, more gracious hosts to their users. Editor’s note: This is the third of five posts explaining the thinking behind our new Messenger.